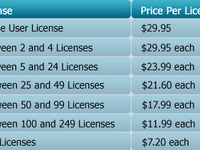 Individual PC users, corporate customers, small business owners, and all in between. Useful for all computer users who value their data. Volume discounts available. Please visit our website for pricing details. 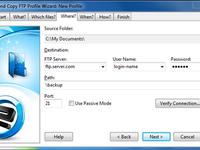 Makes a backup of your data files to another directory, disk or computer across the network. Second Copy Reviews Recently Reviewed! 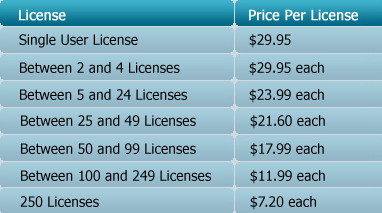 Fast, easy and affordable second chance software. Pros: I love how simple and effective this program is, and most importantly that it does its one true function perfectly without trying to do a bunch of other things at the same time. 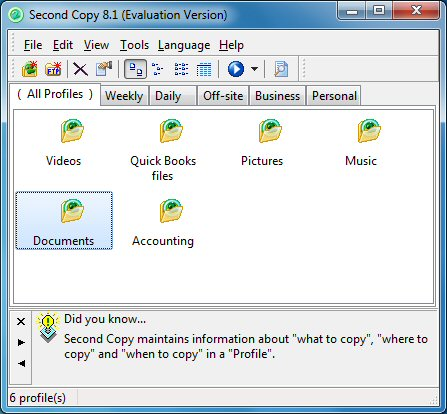 Second Copy makes an exact duplicate of whatever files you setup for backup, including open files, in realtime to ANY other drive in your system. I've even set mine up to utilize a mapped drive I have to an Amazon S3 bucket so that I have a local copy AND a cloud copy at the same time. Cons: There really isn't much to say about this section as the software is really good just the way it is, but I guess IF there was a CON it would be that the interface is a bit dated and could use a visual makeover to make it more visually current. The program works perfectly fine, however. 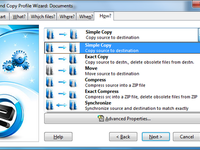 Overall: Affordable and reliable mirrored copies of my critical files made at any and all intervals I choose to whatever locations I want. My experience has been really good. Pros: There are a lot of ways of doing backups in the software. 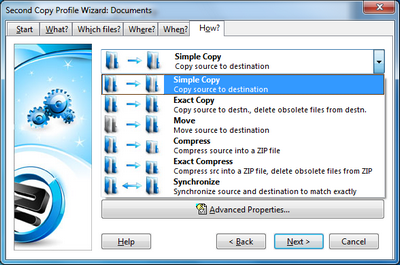 One can include or exclude whatever folder he or she wants in the backup disk. 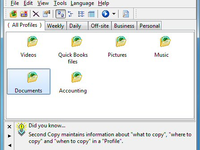 Also, one can select how frequently the software creates a backup of the data. 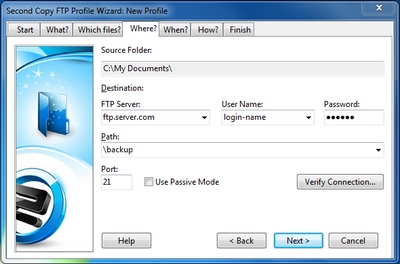 There is an inbuilt hazard tool which creates backup profiles very easily. Cons: I dont have anything bad to say about this software. I have used it for quite for sometime and it has served its purpose well. Overall: I could get efficient backup of my important data on my portable disks. Cons: Given what it does for us and the long time we've been using it, we don't really have any dislikes. You set it up, and you forget about it.